:Modeled after John Bunyan’s famous Pilgrim’s Progress, C. S. Lewis’s Pilgrim’s Regress (1933) represents a number of firsts for Lewis -- the first book he wrote after his conversion to Christianity, his first book of fiction, and the first book he published under his own name. This brand-new annotated edition helps readers recover the richness of Lewis’s original allegory. Often considered obscure and difficult to read, The Pilgrim’s Regress nonetheless remains a rollicking satire on modern cultural fads, a vivid account of contemporary spiritual dangers, and an illuminating tale for generations of pilgrims old and new. Editor David Downing relies both on his own expertise and on previously unpublished sources from Lewis himself to identify allusions to other authors, translate quotations, and explain inside jokes hidden within Lewis’s text. 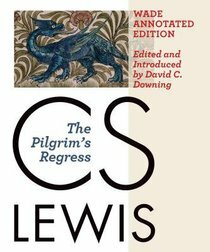 About "The Pilgrim's Regress (Wade Center Annotated Editon)"
C S Lewis (1898 -1963) was one of the intellectual giants of the 20th century and arguably the most influential Christian writer of his day. This Irish-born Oxford and Cambridge academic wrote more than thirty books, allowing him to reach a vast audience, and his works continue to attract thousands of new readers every year. His most distinguished and popular writings include his seven-part fantasy series for children The Chronicles of Narnia (1956); the science fiction Space Trilogy (1938-1945); the apologetical The Problem of Pain (1940), The Screwtape Letters (1942), Miracles (1947), Mere Christianity (1952), and The Four Loves (1960); and the autobiographical Surprised by Joy (1955) and A Grief Observed (1961). Countless Christian writers, pastors, thinkers and artists have credited C S Lewis as a key influence on their faith journey, and his Narnia books have become classics of children's literature. Clive Staples Lewis was born in Belfast, Ireland on 29 November 1898, the son of Albert James Lewis, a solicitor of Welsh ancestry. Lewis became known as 'Jack' as a young child after he adopted the name of his pet dog who was killed by a car. His mother Flora was the daughter of an Anglican priest, and died when Lewis was just ten. Lewis had one brother, Warren - known affectionately as Warnie - who was three years his senior. The two would remain close friends and creative collaborators throughout Lewis' life. When children, they shared a fascination with humanised animal characters like Beatrix Potter's, and wrote and illustrated stories of an imaginary world they called 'Boxen', run entirely by such fanciful beings. Lewis' childhood home was full of books, and he became a keen and intrepid reader at an early age. Until his mother's death, Lewis was educated by private tutors, then moved on to a series of boarding schools in both Ireland and England. It was during his time at the last of these, aged 15, that Lewis gave up his childhood Christian faith and became an atheist. It was also at this time that he developed an intense love for ancient Norse legends and the natural world - an aesthetic complex which he called 'Northernness' and associated with the mysterious inner longing of 'joy'. Under the influence of his tutor William Kirkpatrick, Lewis would go on to a deep involvement with ancient Greek literature. Lewis' academic acumen won him a scholarship at Oxford in 1916, but shortly afterward his studies were interrupted by military service in World War I. Lewis was commissioned as a lieutenant in a light infantry regiment and sent to the Western Front in France, where he experienced the horrors of trench warfare, and was wounded by what would now be called 'friendly fire'. After the war, Lewis resumed his studies at Oxford, and in the years between 1920 and 1923 received firsts in Greek and Latin literature, philosophy, and English. By 1925 he was a Fellow and Tutor in English Literature at Magdalen College, Oxford - a position he would hold for nearly three decades. In 1954, Lewis transferred to Cambridge, where he had been awarded professorship in the new chair of Mediaeval and Renaissance Literature. In the late 1920s, Lewis' circle of literary friends at Oxford coalesced into a discussion group known as The Inklings, which would meet regularly over about two decades. Members shared an enthusiasm for narrative tales, myths, legends - particularly Norse, Celtic, folkloric and mediaeval material - and fantasy fiction. They would read aloud their own works-in-progress and receive suggestions and criticism from their fellows. Members included J R R Tolkien, Hugo Dyson, Owen Barfield, Charles Williams, and Warnie Lewis. Tolkien's The Lord of the Rings and Lewis' science fiction novel Out of the Silent Planet were among the material workshopped with The Inklings. "In the Trinity Term of 1929 I gave in, and admitted that God was God, and knelt and prayed: perhaps, that night, the most dejected and reluctant convert in all England." As a Christian, Lewis maintained a commitment to the Anglican communion in which he was raised, though he tried to downplay sectarian differences in his apologetic writings, extolling instead the perennial essence of orthodox belief. It was the latter which Lewis presented in his popular work Mere Christianity, adapted from a series of radio talks he made for the BBC from 1942 to 1944, and which has become one of the most influential Christian books of modern times. Lewis' theology was basically Anglican, with an ecumenical breadth shaped by the formative influences of Tolkien's and Chesterton's Catholicism, and the Christian universalism of MacDonald. Lewis married relatively late in his life at age 57, in unusual circumstances. He had befriended Joy Davidman Gresham - an American intellectual of Jewish background, and a convert, like Lewis, from atheism to Christianity. Joy was trying to remain in the UK with her two sons, having escaped an abusive marriage, and Lewis kindly agreed to a civil union to enable her to stay. Shortly afterward, Joy was diagnosed with terminal bone cancer. What had begun as a marriage of convenience between friends became much deeper, and Lewis and Joy obtained a full Christian marriage in 1957. As it turned out, Joy was the love of Lewis' life, and when she died after three years of remission, Lewis experienced a shattering grief from which he never really emerged. Lewis related his profound loss in A Grief Observed, which he published under a pseudonym. The story of Lewis' and Joy's love became the subject of the film and stageplay Shadowlands. Lewis died of renal failure in 1963, less than an hour before the assassination of John F Kennedy. Lewis is buried at Holy Trinity Church, Headington, the Oxford parish church with which he and his brother Warnie were actively involved from 1930. These include Into the Wardrobe: C. S. Lewis and the Narnia Chronicles (Jossey-Bass, 2005); Into the Region of Awe: Mysticism in C. S. Lewis (InterVarsity Press, 2005)was listed by Christianity Today as one of the top ten best new books on C.S. Lewis. The Most Reluctant Convert: C. S. Lewis's Journey to Faith(InterVarsity Press, 2002) was named one of Booklist's Best Religion Books for 2002 and was a 2003 ECPA Gold Medallion finalist, and Planets in Peril: A Critical Study of C. S. Lewis's Ransom Trilogy was named one of the five best books yet published on Lewis by the "C. S. Lewis and the Inklings Homepage." Customer Reviews For "The Pilgrim's Regress (Wade Center Annotated Editon)"
The story itself is 5 stars for me, an interesting satire of all the ideas that C.S. Lewis was bombarded with before his conversion. It's got some graphic moments, some of them quite soon into the book, so keep that it mind. As for the volume, 4 stars. It's quite large and I would have thought there would have been a few more annotations for its size. Still, it's sturdy and bound well.